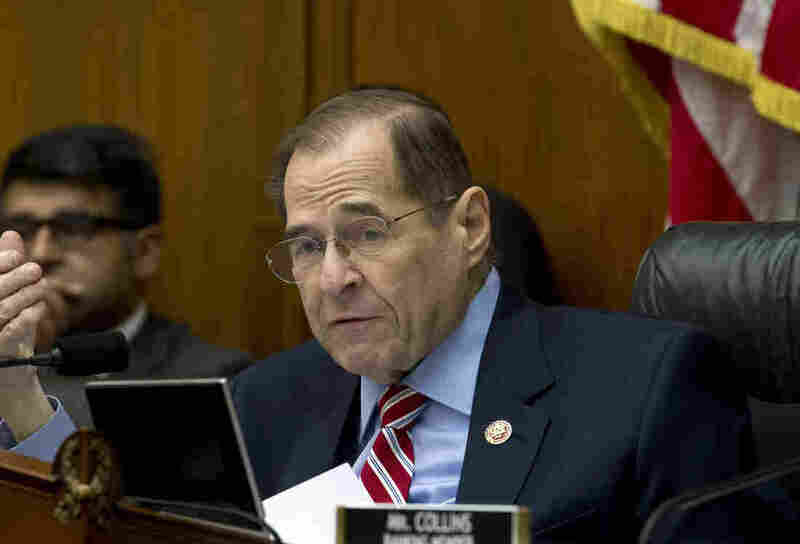 House Judiciary To Investigate Allegations Of Obstruction By Trump House Judiciary Committee Chairman Jerry Nadler, D-N.Y., says his panel is investigating allegations of obstruction of justice, corruption and abuse of power by the president and other officials. House Judiciary Committee Chairman Rep. Jerry Nadler, D-N.Y., sent out 81 document requests to individuals, business entities and agencies related to President Trump for a far-reaching investigation. The committee told reporters Monday that the investigation will focus on three primary issues: whether the president obstructed justice by interfering with criminal investigations; potential corruption such as violation of campaign and financial reporting laws, as well as possible misuse of office for personal gain; and abuses of power to include misuse of the pardon power and attacks on the press, judiciary and law enforcement agencies. The subjects of Monday's document requests include both longtime Trump allies and those in the broader universe of individuals and entities linked to Trump, his administration and his business dealings. The panel has demanded documents from 81 individuals, entities and federal agencies, and given them a deadline of March 18 — just two weeks. A committee counsel said that if document production negotiations with any particular subject were not fruitful, subpoenas could be issued within weeks of that deadline. The subpoenas could be issued if the House Judiciary Committee takes a vote to authorize them. Asked whether he would cooperate with the committee's request, Trump said, "I cooperate all the time with everybody." He also reiterated his position that there was "no collusion. It's all a hoax." In a statement issued by the White House Monday evening, press secretary Sarah Sanders built on the president's comments from earlier in the day. "Today, Chairman Nadler opened up a disgraceful and abusive investigation into tired, false allegations already investigated by the Special Counsel and committees in both Chambers of Congress. Chairman Nadler and his fellow Democrats have embarked on this fishing expedition because they are terrified that their two-year false narrative of 'Russia collusion' is crumbling." "Democrats are harassing the President to distract from their radical agenda," Sanders also said, adding "The American people deserve a Congress that works with the President to address serious issues like immigration, healthcare, and infrastructure. The Democrats are more interested in pathetic political games and catering to a radical, leftist base than on producing results for our citizens. The Democrats are not after the truth, they are after the President." The top Republican on the Judiciary Committee, Rep. Doug Collins of Georgia, accused the committee's chairman, Rep. Jerry Nadler, D-N.Y., of already having made up his mind before launching this investigation. Nadler had said over the weekend that he believed, based on existing evidence, that the president obstructed justice. "We don't even know what the Mueller report says, but Democrats are already hedging their bets. After recklessly prejudging the president for obstruction," Collins said. "Chairman Nadler is pursuing evidence to back up his conclusion because, as he admits, 'we don't have the facts yet.' "
The document demands follow last week's dramatic testimony in the House Oversight Committee, in which former Trump personal lawyer Michael Cohen repeatedly named figures in Trump business circles and accused them of being involved in various scandals. Many of those figures linked to the Trump Organization were named on Monday's list of document requests, including Trump Organization Executive Vice President Donald Trump Jr., Chief Operating Officer Matthew Calamari, Chief Financial Officer Allen Weisselberg, General Counsel Alan Garten and longtime Trump executive assistant Rhona Graff. But the panel also demanded documents from other figures unrelated to the Trump Organization — an indication on the broad scope of the Judiciary Committee's investigation. The panel is seeking documents from entities as diverse as Cambridge Analytica, WikiLeaks, the Trump Foundation, the Justice Department, the White House and the National Rifle Association. The full list is below. "Over the last several years, President Trump has evaded accountability for his near-daily attacks on our basic legal, ethical, and constitutional rules and norms," Nadler said. "Investigating these threats to the rule of law is an obligation of Congress and a core function of the House Judiciary Committee. ... We have sent these document requests in order to begin building the public record." House Democrats have made investigations of the president a priority since they won control of the chamber in November. In particular, Democrats are focused on investigations of the president's finances, the potential for the president to have obstructed justice, and whether his campaign had any involvement in Russian campaign interference. Separate from the Judiciary Committee's inquiries, the chairmen of the House Foreign Affairs, Intelligence and Oversight and Reform committees sent a joint letter Monday to the White House demanding documents relating to communications between Trump and Russian President Vladimir Putin. The chairmen are interested in the substance of any communications during in-person talks or phone calls and say that their requests for information on this topic in February have been ignored. "According to media reports, President Trump, on multiple occasions, appears to have taken steps to conceal the details of his communications with President Putin," the three chairmen wrote Monday afternoon. "We wrote a joint letter to the White House [in February] requesting basic information about whether the President in fact destroyed records relating to his conversations with President Putin... The White House failed to provide any response to our inquiry. As a result, we are now expanding our investigation." Monday's document requests mark a milestone for the Judiciary Committee, which would be the panel responsible for starting impeachment proceedings against the president. "Impeachment is a long way down the road... but we're going to initiate proper investigations," Nadler said Sunday on ABC News, adding that the investigations will be "to present the case to the American people about obstruction of justice, corruption and abuse of power." The White House acknowledged Monday morning that it had received a document request from the House Judiciary Committee. The Justice Department also acknowledged the receipt of the committee's document request. "The House Judiciary Committee's letter has been received by the White House. The Counsel's Office and relevant White House officials will review it and respond at the appropriate time," White House spokesperson Sarah Sanders said. NPR justice correspondent Ryan Lucas and White House correspondent Tamara Keith contributed to this report.